This tutorial will introduce you to OpenGL Shader Language (GLSL) programs and how to make use of them within Isadora v2.5 and later. GLSL is a very advanced programming language; if you are an artist or designer, the source code for a GLSL program can be a bit intimidating on first glance. Nevertheless, if you consider yourself a maker or tinkerer, and can devote a bit of time to experimenting, this tutorial will show you how to make use of this very powerful image processing technology in Isadora. What is OpenGL Shader Language? GLSL is a programming language, similar in style to the C programing language, that tells your graphics card (GPU) how to manipulate or generate images. The power of GLSL shader programs is that, unlike programs that run in your computer's main processor (CPU) they run in parallel for every pixel of the image. This means they are incredibly fast, even with very high resolution images. As of version 2.3, Isadora offers an actor called GLSL Shader that allows you to compile and run GLSL code. There are vast amounts of GLSL code on the Internet: you can find source code on sites like ShaderToy.com and GLSLSandbox, just to name two. But if you are not a programmer, the source code for a GLSL program may look like "gobbledygook" to you. This tutorial will offer strategies for non-programmers, that will allow you not only to compile and run GLSL programs in Isadora, but also to add custom parameters to allow real time interactive manipulation and/or modulation of those images. The first step is to find some GLSL code to try in Isadora. ShaderToy.com is one of the most extensive repositories of GLSL shader code, and allows you to preview the video output of the code in any WebGL enabled browser. Isadora's GLSL compiler has been specifically designed to recognize code from the ShaderToy site so that, in most cases, using code found on ShaderToy is as simple as copying and pasting. Click on the source code editor on the right and hit Command+A (Mac OS) or Control+A (Windows) to select the entire text. This selects all of the source code. Then, from the menu, choose Edit > Copy or Command/Control+C. Switch to Isadora. Make sure the stage is visible by choosing Output > Show Stages or Output > Force Stage Preview. Double-click in Isadora's Scene Editor to show the pop-up toolbox, and type "GLSL" (without the quotes.) You'll see the GLSL Shader actor listed in the pop-up toolbox. Click on the GLSL Shader item to deposit the actor into the Scene. Double-click in the Scene Editor again, but this time type "Projector" in the pop-up Toolbox. Click on the Projector item to deposit the actor in the Scene. Make a link between the video output of the GLSL Shader actor and the video input of the Projector actor. Double click the GLSL Shader actor in Isadora. The first time you do this in a session, you'll see a warning dialog about using GLSL code. If you see this warning, Click OK to continue. The GLSL Source code editor will appear. Choose Edit > Paste to paste the source code from ShaderToy into the GLSL Shader code editor. Click the Compile button to compile the code. (Note that you don't need to close the editor window to see the results; as soon as you hit the Compile button the result of your changes will be visible at the GLSL Shader actor's output.) If all is well, should see no errors. If all is well, you'll see the same image you saw on the ShaderToy site appear on Isadora's stage. Note that the 'time mod' input was automatically added to the GLSL Shader actor. You can adjust this value to change the rate of speed with which you fly through the nebula. There are some common inputs that will be present on the GLSL Shader Actor. Some, like the size inputs will always be present. Others like the 'time mode' input will be present if they apply to that shader. 'time mod' – If the shader generates a moving image, this input controls the overall speed of movement, with 1 being 'normal' speed, 0 being still, and 2 being twice normal speed. 'mouse horz' and 'mouse vert' – Some ShaderToy shaders expect a mouse input. In Isadora, these inputs can come from any source. If you wish to use the mouse, connect the 'horz pos' and 'vert pos' outputs of a Mouse Watcher actor to the 'mouse horz' and 'mouse vert' inputs of the GLSL Shader actor. For many shader programs, it's as simple as that: copy the GLSL code and paste it into the code editor of Isadora's GLSL Shader actor. In the next tutorial, we'll handle a special case for ShaderToy shaders where the shader requires an input texture. IMPORTANT NOTE: ShaderToy recently added a new feature called "Multipass Rendering." If you see tabs labeled "Buf A" or "Buf B" at the top of the source code editor will not yet be able to user this shader code in Isadora. We'll be updating Isadora to allow multipass rendering in a future update. It is a fairly complex shader called Clouds by a user called "iq". Click on the preview to open the editor. To begin this tutorial, repeat the entire process outlined in Tutorial 1 to copy and paste the source code into Isadora's GLSL Shader actor. After you've pasted it, close the editor dialog. When you pasted the Clouds source code into the GLSL Shader actor, the logo changed because there the source code indicates that this program is covered under a Creative Commons license. BY: Attribution – You must give appropriate credit, provide a link to the license, and indicate if changes were made. NC: NonCommercial – You may not use the material for commercial purposes. SA: ShareAlike – If you remix, transform, or build upon the material, you must distribute your contributions under the same license as the original. Licenses may include one, two, or all three of these attributes. In the the case of the CLouds shader, the license is the "Attribution-NonCommercial-ShareAlike 3.0 Unported" license which you can review here. So, when you paste in some shader code and see the icon change to one that includes the Creative Commons logo, please note the terms of that license. It shows respect for the author, and will allow others to benefit from your creativity. If you look under the code editor, you'll see the following. ShaderToy offers the option to input predefined textures (images) as an input to the shader. You can see here that you can supply as many as four different texture inputs. For shaders that do not require any texture inputs, iChannel0 through iChannel3 will be black, indicating that there is no input required on that channel. But, if you do see an image in one of these preview panes, then you will need to provide the equivalent texture in Isadora. 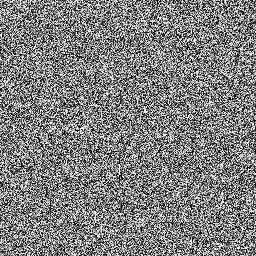 In any case, for the vast majority of shaders, the input texture is a noise source. So, choosing one of the noise pictures supplied later in this tutorial will generally give you the right result. Finding the right texture is simply a matter of experimentation. Unfortunately we cannot give you an easy way to get those textures from ShaderToy, because the links for these pictures change with each session. But since the noise textures are the most commonly used, we've created our own versions below that you can download. Right-click (control-click) the pictures below and choose "Save Image to As..." to save these files to your hard drive so you can import them and use them in Isadora. tex16.png texture as instructed above and import it into Isadora. Create a Picture Player actor and set the picture the media index associated with the picture you just imported. The image should now render correctly. The really exciting opportunity offered by the GLSL Shader actor is the ability to manipulate shader parameters in real time. Shaders accept real-time input through a mechanism known as uniform variables. For example, if you wanted the shader to receive a floating point number, you would add a line like this. // ISADORA_FLOAT_PARAM — This portion simply identified what kind of parameter is being defined. In this case, single floating point number. name — This is where you define the name of the variable. This name must exactly correspond to the variable name given in the uniform variable — statement in the shader code. You cannot include spaces in this name; if you need a space, use the underscore (_) character instead. id — This identifier, which can be from 1 to 4 characters long, uniquely identifies the input. Should you re-arrange the order of the inputs, Isadora uses this identifier to ensure the links to that input are maintained. For each shader program, this identifier must be unique. min — For numeric parameters, this defines the minimum possible value for the input. max — For numeric parameters, this defines the maximum possible value for the input. "help text" — This defines the help text that will appear in the information view for this input. If you share your shader code, you can help those who use it by providing useful, descriptive information about this input. Isadora's philosophy has always been to make it easy for the user to use the program; giving useful details in the help text supports that philosophy. So how do you put all of this in practice? Here's a simple example. // full (1.0) alpha. We assign this to a vec4 called c0. Double-click the GLSL Shader actor to open the editor. Click OK in the editor dialog. The stage output should be totally white. Now start changing the values of the 'red_color', 'green_color', and 'blue_color' inputs of the GLSL Shader actor. You'll see that the output color changes accordingly. Most of the GLSL Shader code you'll find on the Internet is generative: it does not manipulate a video stream. But GLSL Shader code also allows you to modulate a video stream. Because shaders are so fast, you can process HD video streams with very little impact on performance. This tutorial gives a basic example of how to do this. We're going to implement a variation of Isadora's MultiMix actor, which receives up to eight video streams and adds them together to produce one output. In our version, we will be able to modulate the brightness of each stream independently. Add a GLSL Shader actor to your patch and double-click it to open the editor. You will see that a new video input labeled 'video in 1' has been added to the GLSL Shader actor. Connect a video source to this input, and then connect the 'video out' output to a Projector actor. Click OK to compile the shader and closet the editor. As you can see, we've added a new floating point input parameter called 'intensity_1'. In the code, we divide this value by 100.0 to give us a range of 0.0 to 1.0, storing the the result in a variable called intensity. We then multiply the ARGB pixel retrieved by the texture2D statement by this value. If the intensity is 0.0, then the color is black because all the components (ARGB) are 0.0. If intensity value is 0.5 then the video will be at half intensity, because all the color components have been multiplied by one-half. If intensity is 1.0, then the input color is unchanged. Click the OK button to compile the code and close the editor. Connect three video sources to the three video inputs, and try changing the values of the three intensity inputs. You'll see that you can vary the brightness of each image independently. Isadora offers a maximum of eight texture inputs to the GLSL Shader actor. So, with a bit of copying, pasting and editing, you could expand the code above to handle as many as eight video inputs. At this point, the design philosophy of Isadora -- make it easy for the user -- comes into conflict with the complexity of OpenGL Shader Language. In the end, there's no getting around the fact that some of the shader programs out there are extremely complex. Thus, to successfully change them would seem to require a great deal of skill. (If it offers you any comfort, the author of this tutorial is also the creator of Isadora. While he is a very skilled C++ programmer, even he finds code in many of these shaders daunting!) So, how in the world is a non-programmer supposed to modify code like this? In this tutorial, we're going to do our best to offer some guidelines that will allow non-programmers to successfully add real-time control to GLSL Shaders. To be sure, it will require some time and effort. But, if you are the type that likes to tinker and experiment, we feel you'll be able to get meaningful results. Let's give it a try. First let's get the code from this page on GLSL Sandbox: http://glslsandbox.com/e#22343.0. As before, you'll need a GLSL Shader actor connected to a Projector actor. Double-click the GLSL Shader actor and paste this code into the editor and hit Compile. You should see a slightly bumpy green sphere. The main() function is a good place to start looking, because it is the main function that does the work to render the image. (There are other functions in this code, e.g., float sphere() and float sinusoidBumps(). The names of these functions give you a clue that they probably have to do with a) rendering the sphere, and b) the bumps on the sphere. Things like function names and variable names may help you discern good places to start tinkering. Look for some constant values, like 1.0, or 22.5. Change the value of one of those numbers and hit Compile. At first, don't change the value by a lot, e.g., if the value is 3 then change it to 4 or 5. Does something interesting happen? If not, choose File > Undo to restore the value. Then try a bigger change, e.g., if the value is 3, make it 300. Eventually, you'll change some value that does something interesting to the resulting image. In the case of the source code given above, we discovered that the value 0.1 in the function sinusoidBumps() led to a cool effect, making the surface of the sphere more or less bumpy. and insert it after the uniform vec2 mouse; statement. And finally we modify the function inside of the sinusoidBumps() function. Now hit the Compile button and close the editor. You'll see that a new parameter has appeared at the bottom of the GLSL Shader actor called 'bumpiness.' Apply some real-time input like the output of the Sound Level Watcher to watch the fun begin. If you find or create a shader that you find especially useful, you may want to add it to Isadora's toolbox for easy access in the future. This tutorial explains how to do that, as well as introducing some further comment statements that allow you to personalize your shader. Copy the text from the GLSL Shader actor's editor into any text editor. Then save the file, giving it a meaningful name that ends with a .txt extension, e.g. "my_shader.txt"
If you don't find a folder called GLSL Plugins in the TroikaTronix directory, then create it. Place the text file you created above in the GLSL Plugins folder. In the Toolbox, click "GLSL Shaders"
You will see the new plugin listed there; the name will be the same as the file name of the .txt file. Click the plugin to add it to the scene as you would with any Isadora actor. After the shader source code to the GLSL Plugins folder, using this new actor is as simple as clicking it in the toolbox or searching for it using the popup toolbox. You can further customize your shader by adding additional comment statements recognized by Isadora. // ISADORA_PLUGIN_COPYRIGHT("(c) 2015 My Name Here") — Allows you to add a copyright statement to your plugin. // ISADORA_PLUGIN_LICENSE("License info here.") — If you would like to add a Creative Commons or other licensing information to this plugin, give the license information here. To make your plugin easy for other to use, we hope that you will add the ISADORA_PLUGIN_NAME and ISADORA_PLUGIN_DESC statements. Sharing your new GLSL Plugin is as simple as posting the source code. They don't have to be Isadora users — any GLSL compiler/program can use them. Keep in mind that programs other than Isadora will not recognize real-time input statements (like ISADORA_FLOAT_PARAM.) Because of this, the plugins probably won't function as expected in other software. Addendum: Real-Time Input for GLSL Types Other Than Float & Int? You may need to input real-time values to types other than float and int, but Isadora's comment format does not allow for types other than this. Here's how to solve that problem. Even though shaders are incredibly fast, they are not an unlimited resource. Remember, the program you see in the editor is going to be executed for every pixel in the image. For a 1920x1080 image, the GLSL shader program will be executed over 2 million times! If you are experiencing performance issues (e.g., low frame rates) take a look at the shader code. If you see statements that start with "for" then the shader has a "for/next" loop, and are likely to be inefficient. Less critical, but nevertheless inefficient, are statements that being with "if" or "else". These indicate an "if/then" construct, which will also slow the shader down. If you are a non-coder, you probably won't be able to modify those for, if or else statements to improve performance. Your only option in this case is to lower the resolution of the image to reduce the load on the graphics card. In this case, a variable called 'x' will count up from 0 to 255, with x being incremented by one after each repetition. That's 256 repetitions in all, and over 530 million calculations for a 1920x1080 image. To reduce the number of repetitions, change the upper limit of the for/next loop to a smaller value. (In the example above, that number is shown in bold.) This will change the way the image looks, but you can decide if the result is acceptable or not.